Published By: Nova Scotia Business Inc.
Companies are realizing the significant advantages of nearshore versus offshore outsourcing. Nearshore outsourcing reduces the complexity and risks associated with the distance between a client and a service provider. It also reduces travel costs and there are little to no time zone differences. Several excellent nearshore locations exist in North America. This paper will focus on the often-overlooked Canadian province of Nova Scotia. 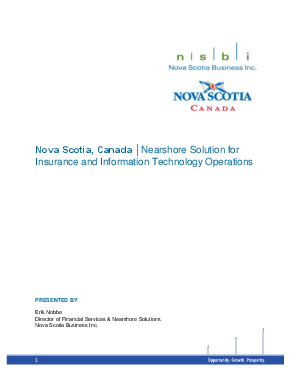 Despite its relative anonymity to the insurance and technology industry, Nova Scotia compares equal to or better than other North American nearshore locations with respect to cost, quality and geographic proximity. Ironically, a sincere part of Nova Scotia's allure is the quiet quality of its dedicated work force.